EMMEGI (UK) has launched the Automatica ER a new electronic single head rising blade saw equipped with automatic NC bar loading and four different diameter carbide tipped blades ranging from 350 to 650mm. Designed for 90°cutting of aluminium profiles, it incorporates bridge clamps in both the bar feed and cutting zones which ensure accurate positioning and cutting even with different profile geometries. It can cut profiles of varying diameters depending on the blade selection and has the option of swivelling clamps for positioning and cutting irregular shaped profiles if required. 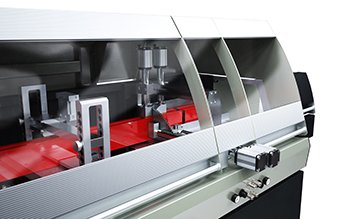 Emmegi says the machine is easy to set up and control via a simple PLC equipped console unit with a graphic display. Users can programme single cuts or cuts from a cutting list either on the machine directly or remotely via a USB or network link. The machine comes with a 5.5kW three phase brake motor as standard but customers can also opt for a motor with an inverter to control the blade rotation speed. Other options include a pneumatic system to automatically separate the cut piece, an automatic bar loading magazine and custom drilling units for specific requirements.